This school, established in 1994, is primarily addressed to graduate students or postdoctoral with an interest in Neutron Scattering. The School will comprise lectures, tutorials, practicals and hands-on data analysis sessions, covering diverse aspects of Neutron Scattering, but with an emphasis on techniques and instrumentation designed to study the : Microscopic Dynamics of Simple and Hydrogen-bonded Quantum Fluids, Quantum Momentum Distributions, Effective Born-Oppenheimer Potentials, High Energy Excitations, High Energy Neutron Imaging, Deep Inelastic neutron scattering , High Energy Neutron Irradiation Effects. The School will start on Saturday, September 25th 2010, with a series of in introductory lectures covering the fundamental aspects of neutron scattering and neutron instrumentation. During the next days, a series of lectures will provide the basis of electronvolt neutron spectroscopy, with particular on new instrumental and data handling techniques. Practicals will be carried out at the neutron@BTF pulsed neutron source at Laboratori Nazionali di Frascati – INFN. 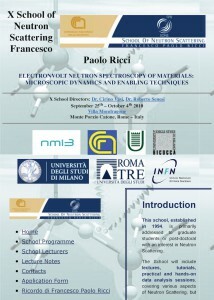 At the end of the school, students are invited to attend the International workshop: “High-energy neutrons for science and society “, which will be held on October 5th and 6th 2010 at Villa Wolkonsky, the UK ambassador’s residence in Rome.